The working relationship between Capital Alliance and Marriott International Inc. has deepened with the hotel operator confirming a new presence in Fishermand Bend. The duo will work together to introduce the AC Hotels by Marriott brand to Australia within a slim tower slated for 199-201 Normanby Road. Today's announcement follows on from Marriott International also penning with Capital Alliance for their forthcoming Waterfront Way mixed-use development in nearby Docklands. 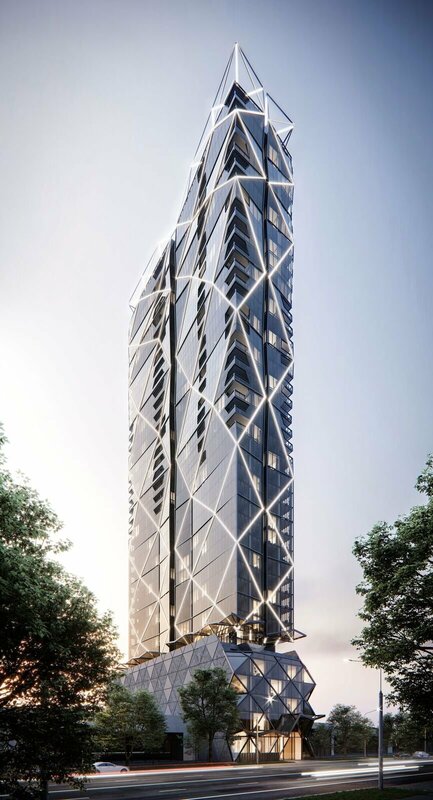 Capital Alliance was unveiled as the purchaser of the Fishermans Bend site late last year, in the interim appointing DKO Architecture to rework the approved scheme on site. The fresh design will see approximately 200 hotel rooms in a 40-level mixed-use building, in addition to 111 private apartments. Akin to the Waterfront Way development, 199-201 Normanby Road will also feature an infinity edge pool with views across Melbourne's skyline. In line with other AC Hotels worldwide, the new hotel includes a range of collaborative spaces. The AC Lounge is one of three food and beverage tenancies and is supplemented by a co-working space, a 24-hour fitness centre and function space. Having replaced an approved Artisan Architects-designed scheme for the site, DKO Architecture has taken the exterior in a completely different direction. The highly angular tower form is highlighted by a neon-clad stretched diagrid pattern, with angular balcony openings annunciating the residential upper floors. We are really excited to partner with Marriott International to bring a new hotel to Fishermans Bend. We believe in the potential of this area, just as we believed in Melbourne Docklands, and it’s great that Marriott International shares our confidence. Just a stone’s throw from the city, Fishermans Bend is going to redefine inner suburban living and the AC Melbourne Southbank will attract sophisticated and discerning travellers to the area. 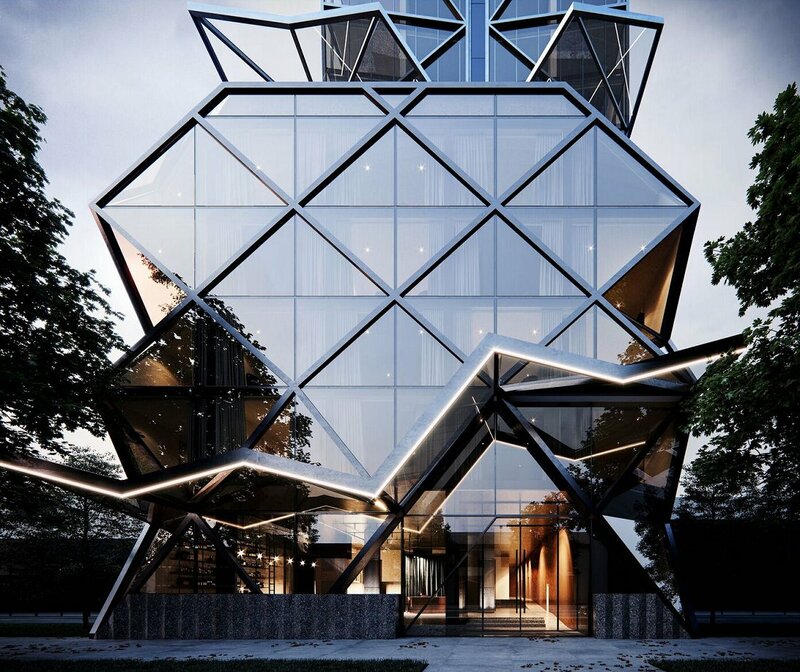 The AC Melbourne Southbank underscores the growing demand we’re seeing in Australia for premium lifestyle hotels that offer style and functional design, as well as authentic and memorable travel experiences connected to the location. The signing of AC Melbourne Southbank is a testament to Marriott International’s continued success in Australia, where we currently operate 18 hotels and have 17 in the pipeline. Across Australia, we’re seeing growing demand for lifestyle brands like AC Hotels by Marriott, so we are delighted that we’ve found the right location and the right partner to bring this brand to market. 199-201 Normanby Road represents the third development where Capital Alliance has combined apartment and hotel uses. The aforementioned 3-43 Waterfront Way includes 200 dedicated Marroitt International rooms whilst 677 La Trobe Street also sees a Peppers Docklands apartment hotel in situ. Work on both Capital Alliance's current projects is scheduled to start this quarter with the process of assigning builders to the Waterfront Way and Normanby Road sites in progress. The Fishermans Bend development is scheduled to be completed during late 2020. Good to read that the Docklands Marriott is close to a start. I was wondering if they were going to wait on sales for the Docklands Residences.